Chatbots are the next paradigm shift on the internet. Downloadable apps are decreasing and have already been surpassed by chatbots on websites and social networks. As apps wane, chatbots are replacing how users search for and get information. By 2019, 20% of brands will abandon their mobile apps. Here are a few companies that are using chatbots Facebook Messenger to interact with their customers. Here are a few case studies about how companies are using chatbots in unique ways on their websites. H&M is a global fashion company that promotes sustainable materials and human labor. H&M created a chatbot to help mobile customers assemble outfits online by guiding them through the online store. H&M’s chatbot collects specific information and responds differently based on the information provided. The chatbot identifies your gender and style, suggests an outfit that matches your style, and provides the total price of the outfit. If you don’t like the suggested outfit, the chatbot gives you different options, allows you to save the outfit, and gives you the opportunity to socially share the outfit. H&M increased sales after implementing the chatbot. H&M is one of many retailers experimenting with chatbots and leveraging chatbot technology as a mobile marketing opportunity. Amtrak provides passenger rail service for people in the lower 48 states in the US. Amtrak created a chatbot named Julie that guides users through the website using natural language capabilities. Julie can respond via text, and Julie can also vocalize an answer along with the text. Julie helps customers find information on reservations, station and route information, as well as information about the rewards program. Since the implementation of Julie, Amtrak has increased bookings by 25%, saved $1 million in customer service email costs, saw a 50% growth in user engagement, and increased the per booking revenue by 30%. The Julie chatbot is an upgraded version of Julie the telephone agent. Amtrak didn’t get rid of Julie the phone rep, but rather expanded Julie’s presence by adding responsive chatbot technology to Julie’s functionality. The Amtrak website has an average of 375,000 visitors per day, and the rail service transports 30 million passengers per year. 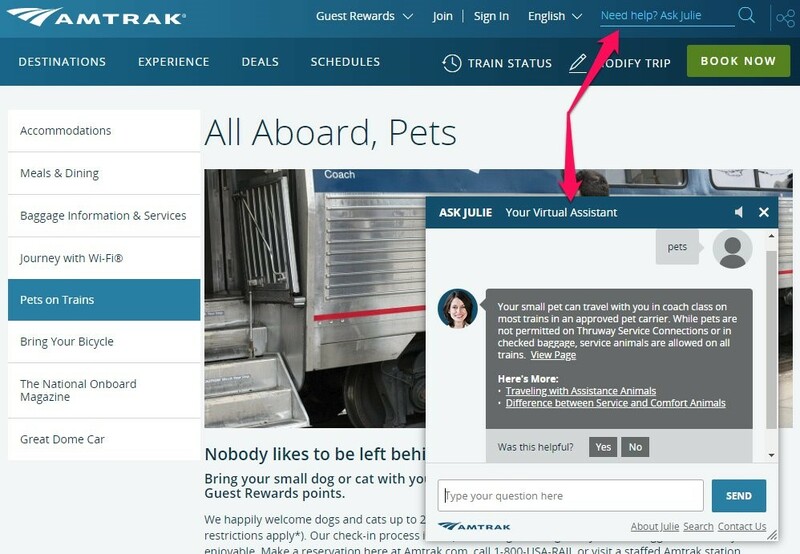 Amtrak wanted a solution to provide customers with quick access to online self-service. Julie answers 5 million questions per year, and Julie has an upsell feature where a customer can book a hotel room along with round-trip train tickets. FirstJob is an online recruiting company that matches recent college graduates with entry-level positions and internships by utilizing their social networks. 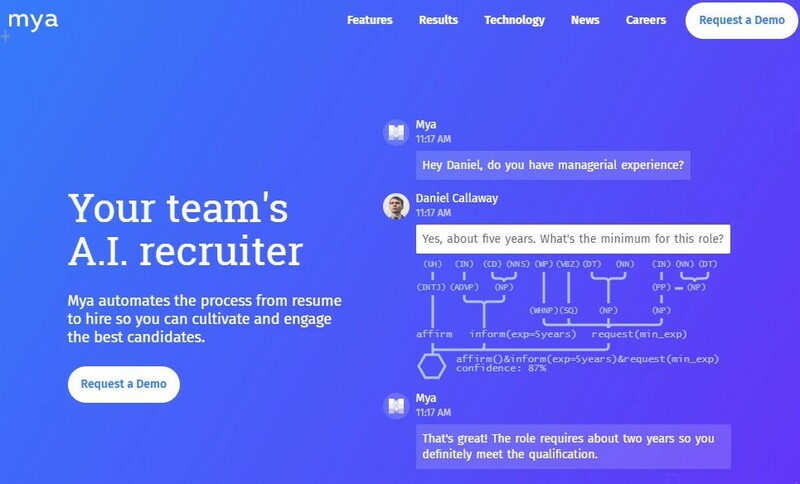 FirstJob created a chatbot named Mya, an AI recruiting assistant that manages a candidate database where recruiters and hiring managers can easily find job candidates. Mya talks to thousands of candidates simultaneously via Facebook, Skype, SMS, and email. Mya asks pre-screening questions, responds to FAQ’s, provides application status updates, gives guidance and tips to candidates, alerts candidates when positions are filled, and sends assessments and challenges to each candidate. Mya can rank each candidate from most to least qualified based on factors such as experience, recent job activity, and social engagement, and this information is provided to recruiters. Mya automates about 75% of the qualifying, screening and engagement process. The recruiter efficiency rate is increased by 38%, and the candidate engagement rate is increased by 150%. Utilizing a chatbot that helps both job seekers and employers find each other is a new and interesting application for AI technology. Expensify is a software company that automates expense reports and travel arrangements for businesses in all industries. Expensify created a chatbot called Concierge that guides users through the initial set-up process, and helps users troubleshoot problems in the expense report submission process. Concierge can detect what problem is causing the system to reject an expense report, and instructs the user how to fix it. Concierge has access to travel pricing in real time, and it can notify users if their travel pricing is the best value. Concierge can talk to users on the Expensify website, interact with users on mobile devices, and is compatible with Slack (a team collaboration tool). Concierge has helped to reduce banking problems by 75%. One of the biggest advantages to the Concierge chatbot is that it’s a preventative tool. When an Expensify user is trying to submit an expense report and they get a system error, Concierge can help diagnose the problem and find the solution. It saves a lot of time for managers and employees to submit their expense reports with the least amount of trouble. BabyCenter is a pregnancy and parenting digital destination. Not only do they provide information and advice, but they also sell baby products and gear. 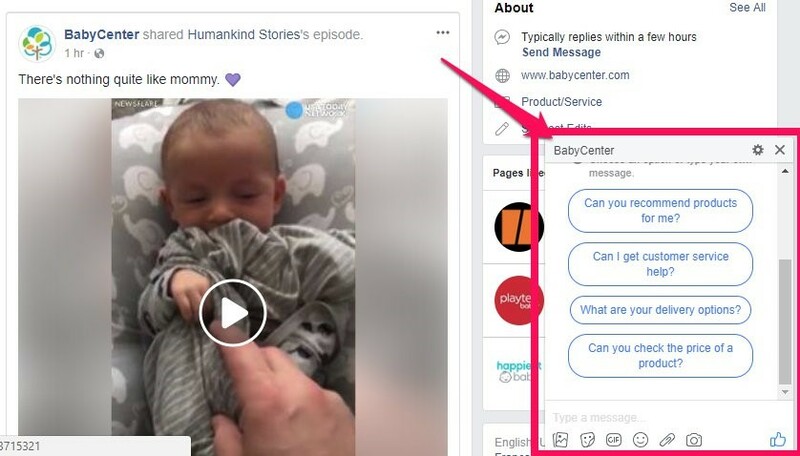 BabyCenter created a Facebook Messenger chatbot to drive traffic to their website because they discovered that Facebook messages were opened more often than emails. The two goals of implementing a Facebook Messenger chatbot were to drive traffic to the website and to create an alternative content delivery system. BabyCenter also wanted to increase the level of engagement with their website users. The chatbot achieved all of these goals. An average of 84% of users read the Facebook message, and 53% of those who opened the message also clicked through to the BabyCenter website. It is estimated that Facebook Messenger chatbots have a 1400% higher engagement rate than email.